My name is Tom Morley. 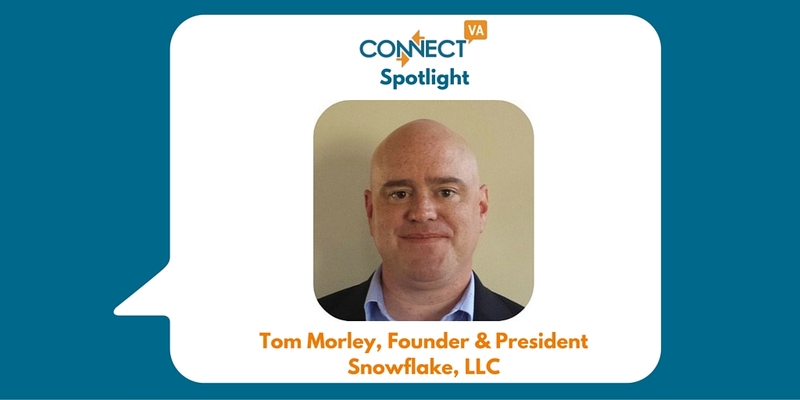 I’m Founder and President of Snowflake LLC, a consultancy dedicated to helping local non-profits create actionable strategies, market effectively, improve organizations and operations, and position people for success. I spent most of my career as a leader in “Big 4” consultancies BearingPoint, Inc.’s and Deloitte Consulting, LLP’s Organization Strategies service areas prior to launching Snowflake LLC. We’re members of the American Society for Association Executives, the American Sociological Association, the Loudoun and Top of Virginia Chambers of Commerce, and the Catholic Business Network of Northern Virginia, and a regular contributor to 4good.org. We also regularly publish useful insights, which we announce on Twitter: @snowflakellc. How is your work having an impact on the nonprofit sector? Non-profits do exceptional work with limited resources, and get great results. Not many would turn down help focusing activities, finding more resources and applying them in the best ways, and just “making time” in general, however. Non-profit leaders and consultants have told me the market will benefit from new perspectives and ideas, and we’re bringing these from over 50 clients in all sectors, in the US and abroad. I also think non-profits deserve the highest professional quality standards—something we were drilled on and are bullish about. Big consultancies aren’t serving local non-profits, though. We want to fill this gap, based on top-tier, global consulting experiences delivered through local lenses, with scalable services, affordable costs, and flexible terms. Every time I talk to a non-profit leader or staff member, I’m in awe of the passion, dedication, and endless amount of work that people put into helping their communities. This is the passion I was missing at BearingPoint and Deloitte—knowing that each and every day, I’m doing something that will make a difference in society—and is the primary reason I decided to go out on my own. The idea that I can use my talents to take what non-profits are doing and magnify—possibly exponentially—their effects of their contributions is incredibly rewarding. It’s also quite humbling, though, because I’m not doing anything directly for others through Snowflake LLC. I’m just trying to make it a little easier, and a little more rewarding, for the people who do. Tell us about your biggest accomplishment in your position? Honestly, just launching the company and keeping it afloat this first year and a half is probably my biggest accomplishment, and it would not be possible without an incredibly loving and supportive wife. It has not been easy and we’ve made a lot of sacrifices, but then I think that aspect of the experience has been an amazing gift, as it’s fundamentally changed our perspective on life and perhaps brought me closer to the clients I want to serve. It felt like a big accomplishment to help our first non-profit client (Loudoun Habitat for Humanity) as well. These are just milestones, though. I really haven’t accomplished anything close to what I want to through this endeavor, but I’m optimistic that with time, we’ll prove ourselves and hopefully start making a significant impact. What’s coming next for your business that really excites you? The entire journey is exhilarating. Snowflake LLC is just beginning what hopefully will be a long trip helping non-profits, seeing the benefits, and learning how to use each new experience to help the next organizations. We did recently launch a campaign called the “Non-profit Consulting Access Initiative,” to let non-profits know that we’re out here and tell them what we’re trying to accomplish. I’ll emphasize “access”—I want people to know that regardless of size or budget, they deserve and can access the benefits of top-tier consulting, whether they’re just reading our articles or they’re working for us directly. If we can help a non-profit with an important community mission take a significant step forward, we’ll make it happen. It’s the possibilities that really excite me. How does your work empower individuals, advance organizations, and strengthen community? I am blessed with knowledge, skills, and experience than helps make organizations better. Snowflake LLC gives me a vehicle to use these talents specifically to help non-profits that empower individuals and strengthen communities. Strong non-profits form the foundation on which social welfare, opportunity, and human dignity is built. My hope is that local non-profits will see the value we can offer, understand that it is our mission to make sure they can leverage our serviced, and work with us to ensure consistent delivery of the services they offer and expand the scope and/or coverage of their social programs and initiatives. We wholeheartedly embrace ConnectVA’s mission and share its commitment to building and sustaining a vibrant non-profit community across the state.